Flying into Toulouse you can’t help but be impressed with the large numbers of Airbus aircraft that are spread out around the airport. You’ll see everything from the Beluga transport aircraft to the latest A350 taking off on another test flight. 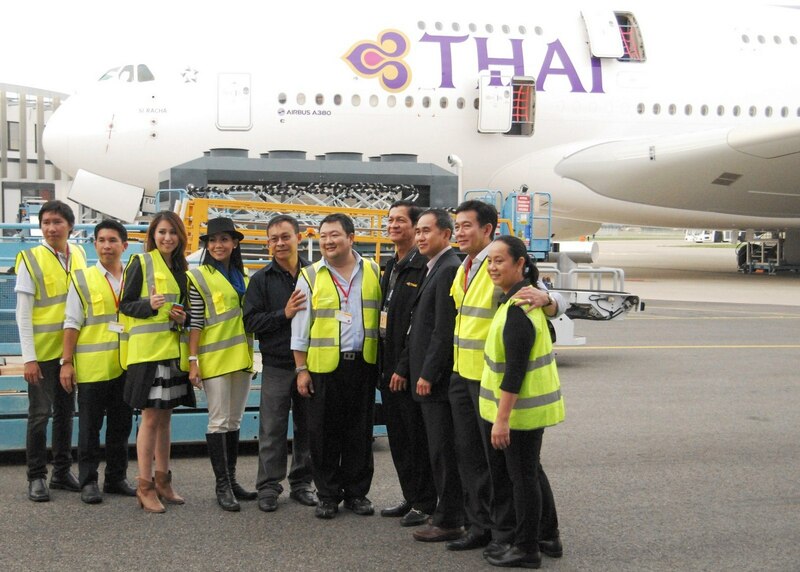 Thai Airways are about to begin flights with their latest Airbus A380, the fifth in its fleet, as they continue to expand their services with this huge aircraft. Last month we were lucky enough to join Thai Airways at the Airbus Headquarters, in Toulouse, to take a look around their new A380 as the aircraft manufacturer prepared it for handover. Before we made our way to the aircraft we were given an insight into how you spec an airliner of this size and saw how these amazing machines are put together. Our first stop was the Cabin Design Studio. If you have ever ordered a new car you will know the time it can take to decide on the interior colour, seat material and optional extras. 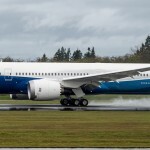 Now if you imagine you have 507 seats to spec along with floor coverings, toilets, meeting areas, galleys and crew quarters, along with entertainment systems and cabin baggage storage, it can be quite a task. With four other aircraft already in service it hasn’t been too hard for Thai Airways to decide on the interior colours and layout for this A380. In the Cabin Design Studio you could see just how all the material types and colours are used in a fuselage section mock-up to see how they look under the various cabin lighting options. The designers laid out on a long table the range of swatches just used for the Thai interior. Of course you do need to see how various cabin layouts can look in an aircraft environment, especially one the size of an A380. For this you can wonder around the full size demo aircraft interiors for every model that Airbus assemble. As you walk into this particular building It’s like entering a train station with each (wingless) aircraft type alongside their own platform. You enter by the normal cabin door and once inside you can really see what interior options are available. On the lower deck you can see such layouts as an open galley/bar, single crew member sleeping area, Economy and Premium Economy seating. There are options for overhead lockers with motors that assist when you close them which not only make it easier to shut but also offer much greater headroom below. If you walk upstairs to the upper deck you can see the First Class Suites, ‘normal’ First Class, Business and Economy cabins. There are also meeting areas, extra storage units below the cabin windows and space for crew quarters or even a duty free shop! It can take airlines between 8 and 14 months to get the layout and look just right on the A380. A short drive to the other side of the Toulouse airfield is the aircraft handover area. Waiting on the apron was the A380 HS-TUE (Si Racha). It is great just to be able to wonder around such a large piece of engineering and take in the 4 million parts with its 500km of electric cables and the 5 sets of landing gear with 22 wheels that make up this super jumbo. It was soon time to climb the stairs to see inside this beast – but not before we had put on the elastic shoe covers to protect the new flooring. The carpet was covered with protective paper but we were taking no chances – we didn’t want to mark this very expensive piece of machinery. Inside it feels spacious and roomy even with the 435 Economy seats. Airbus have gone to great lengths to provide a spacious and comfortable interior. There are 5,000 mood lighting scenarios on board, using a wide choice of fluorescent and LED technology and the cabin air, all 1,570 cubic meters of it, is changed every 3 minutes. From the rear you can walk up the spiral stair case to the upper deck. 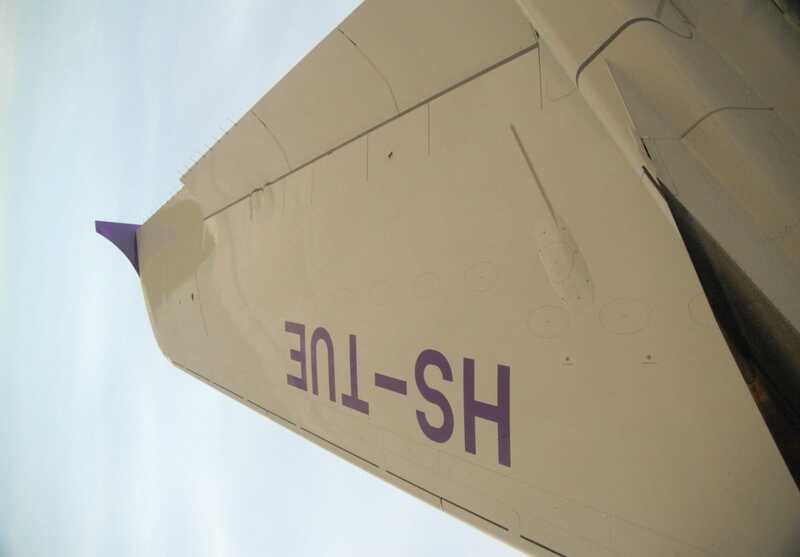 Here there are slightly less seats in economy across the cabin due to the shape of the fuselage. 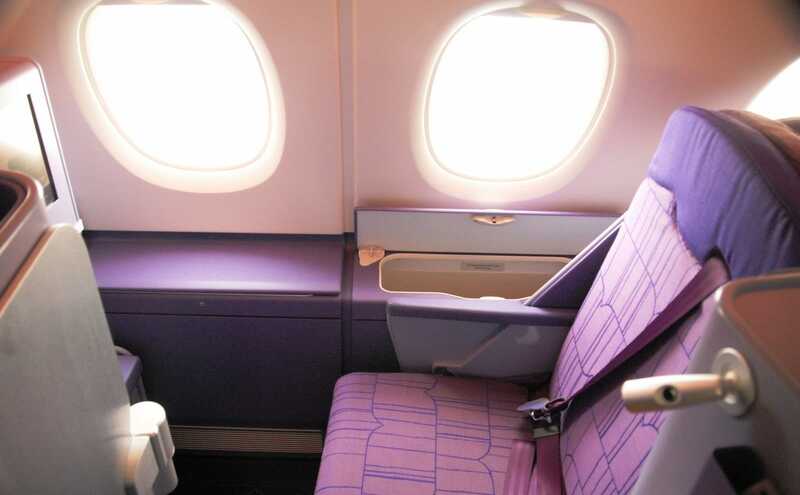 Instead of three 18 inch wide seats between the window and each aisle you will find two. 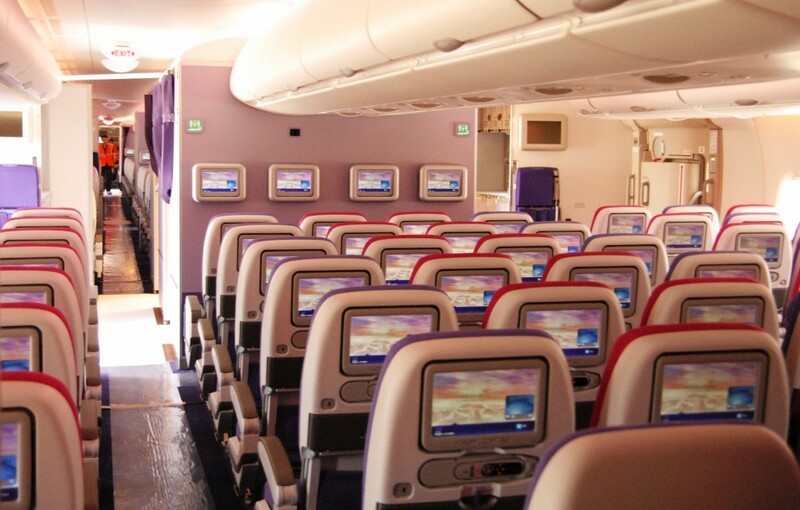 The curve of the cabin means that the seats cannot be fitted as close to the windows. 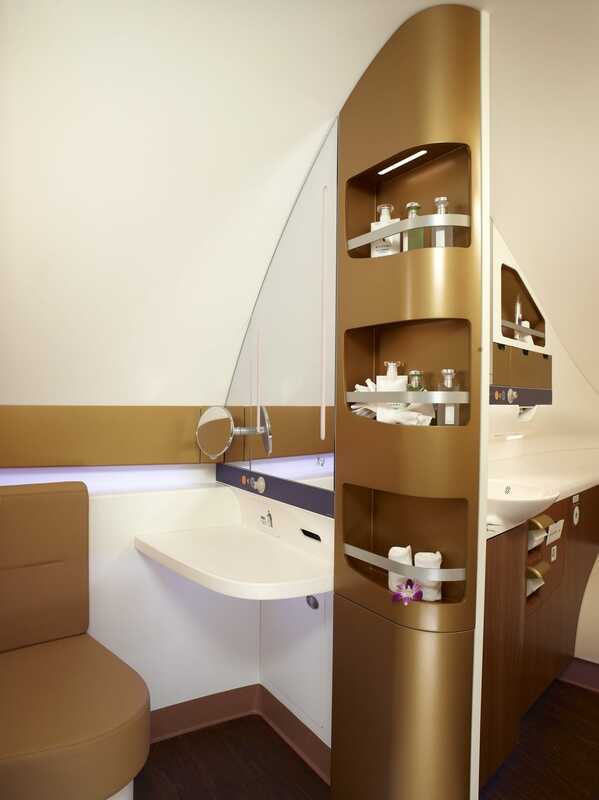 Rather than leave this as just space Airbus have added extra storage bins between the seat and window. 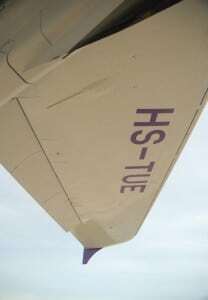 All this helps to provide 15% more bin volume per passenger in economy class. 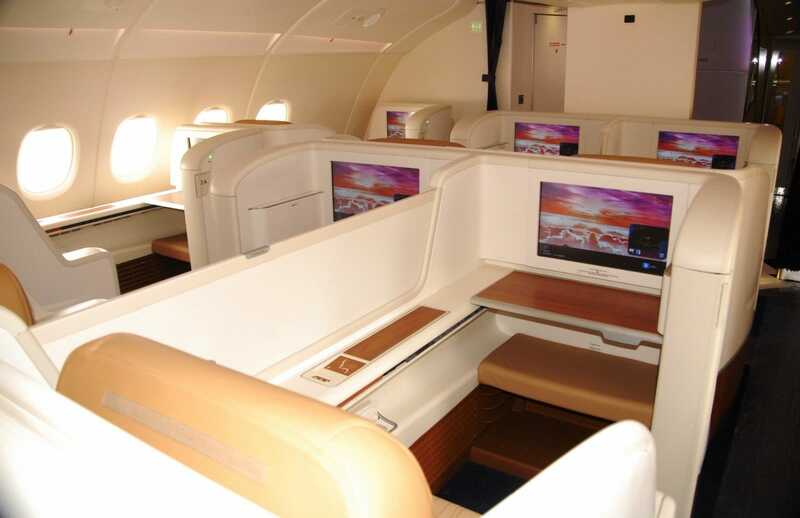 At the front of the upper deck you will find the 12 seats in Royal First Class. These are huge and provide fully-flat beds for relaxing on a long haul flight. To one side of the cabin and near the staircase to the lower deck, you will find the lavatory. Inside there is plenty of room and has a changing room. On the opposite side there is a small area where up to four passengers can relax together, hold a meeting or work. For passengers heading to Bangkok from the UK you will have to wait until October 2014 until you can travel on the Thai Airways A380. 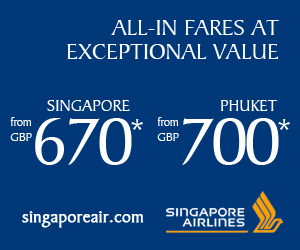 In the meantime if you need to fly to Japan then you could go via Bangkok and get to experience the A380 quiet and comfort. 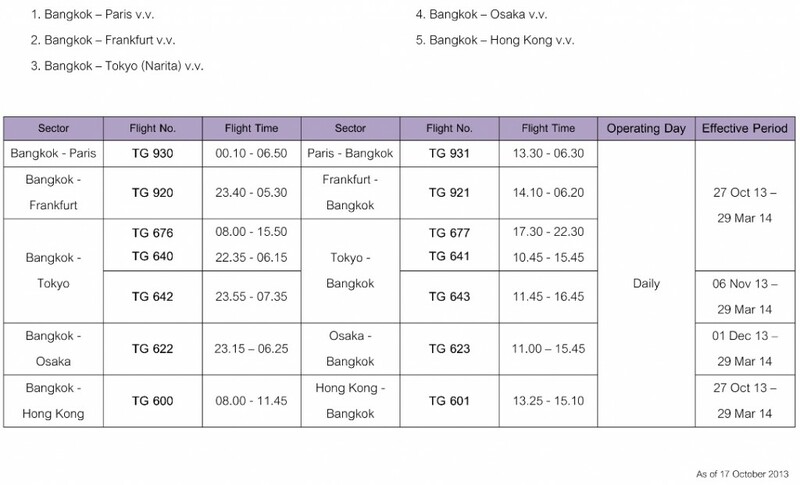 This latest Thai Airways arrival will be used to add an additional flight per day between Bangkok and Tokyo, starting tomorrow the 6th November. The sixth super jumbo is due to be in service from the 1st December on Bangkok- Osaka route.